This study is an adaptation in a Spanish sample of the Mindful Attention Awareness Scale (MAAS) (Brown & Ryan, 2003). The study was conducted with a clinical sample of patients with anxiety disorders, depressive disorders and borderline personality disorder (N = 100), a sample of the general population (N = 100), and a sample of university students (N = 54). The criterion validity was verified using correlations with CBAS, BDI-II, BAI, and AAQ-II. The results indicate a high degree of internal consistency (α = .88), equivalent to those obtained in studies conducted in other countries with samples consisting primarily of students. Significant statistical differences were found between the scores of the sample groups. 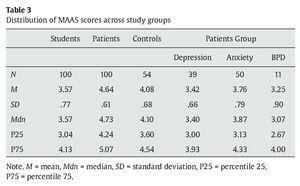 The general population sample demonstrated a higher degree of mindfulness as measured by the MAAS than the student sample, which in turn demonstrated a higher degree of mindfulness than the clinical sample. Se presenta una adaptación al español de la Mindful Attention Awareness Scale (MAAS) (Brown y Ryan, 2003). El trabajo se realizó con una muestra clínica de pacientes (N = 100) con trastornos de ansiedad, depresivos y trastorno límite de la personalidad, una muestra de población general (N = 100), y una muestra de estudiantes universitarios (N = 54). La validez de criterio se contrastó mediante correlaciones con CBAS, BDI-II, BAI y AAQ-II. Los resultados demuestran una elevada consistencia interna (α = .88), equivalente a la encontrada hasta ahora en otros trabajos con muestras fundamentalmente de estudiantes de otros países. Se encontraron diferencias estadísticamente significativas en la puntuación entre las tres muestras. Los sujetos normales muestran un mayor nivel de mindfulness, al menos tal y como este es medido por la MAAS, que los estudiantes y estos últimos mayor que los pacientes con sintomatología clínica de ansiedad y/o depresión. Mindfulness is a complex construct that does not yet have a generally accepted operational definition in the field of psychology. Mindfulness can be understood as the ability to pay attention on purpose, in the present moment, in a nonjudgmental manner (Kabat-Zinn, 1990). Bishop et al. (2004) contend that acceptance is another essential component of mindfulness in addition to attention and awareness of the present. Cardaciotto, Herbert, Forman, Moitra, and Farrow (2008) view mindfulness as a two-dimensional construct composed of awareness of one's experience and the concomitant acceptance of that experience, with the two components being conceptually and empirically different. Based on convergent, discriminant, and criterion validity studies conducted using large samples, Brown and Ryan (2004) proposed that, although the concepts are related, "acceptance" does not provide a qualitative advantage over the single factor of "attention and awareness of the present." The different ways of measuring mindfulness also reflect the diversity of definitions, with scales that vary in complexity from the use of a single factor, attention to the present moment (Brown & Ryan, 2003), to the use of five factors: observe, describe, act with awareness, nonjudging and nonreactivity. (Baer, Smith, Hopkins, Krietemeyer, & Toney, 2006). This terminological and conceptual confusion is the result of researchers approaching the subject from different perspectives. Mindfulness has been widely studied in recent decades, with the number of scholarly articles increasing from 80 in 1990 to more than 600 in 2006 (Brown, Ryan, & Creswell, 2007). There is now even a scientific journal devoted to the subject. The topic's popularity among researchers and clinicians is all the more noteworthy given that mindfulness is a quality of consciousness and that, except among cognitive scientists and those psychologists with a philosophical orientation, consciousness has received relatively little attention in psychological scholarship, research, and clinical practice. Equally noteworthy is the fact that mindfulness represents a challenge to western thinking and to the established paradigms in psychology, where the superiority of the self is considered the appropriate guide for human behavior (Brown et al., 2007). With evidence mounting regarding the beneficial effects of mindfulness, researchers have begun to take an interest in the processes that might explain such effects. Until now, it has been suggested that these processes involve changes in the use of attention, cognition, and emotion. However, another significant process to consider is exposure. Given that mindfulness requires contact with external and internal phenomena as they occur, mindfulness may lessen sensitivity and emotional overreaction and result in quicker recovery, greater tolerance and more effective acceptance of unpleasant emotional states (Borkovec, 2002). Voluntary exposure to unpleasant or challenging events and experiences may thus lessen emotional distress and facilitate more adaptive behavioral responses (Sloan, 2004). Conversely, strategies such as experiential avoidance, which lead to distracted states and the suppression of unpleasant events and experiences, can make the extinction of emotional responses more difficult. As a result, a body of experimental research has emerged suggesting that voluntary exposure is a component of mindfulness (Arch & Craske, 2006). Mindfulness has also been related to behavioral regulation. After reviewing a series of studies, Brown et al. (2007) proposed that mindfulness not only facilitates behavioral control with adaptive ends, but also promotes behavioral regulation that optimizes well-being. According to the authors, the awareness brought about by mindfulness facilitates more flexible and adaptive responses and helps to minimize automatic or impulsive reactions. In this regard, mindfulness can strengthen the ability to respond according to values, objectives, or personal needs rather than responding out of habit or reacting to components of a situation. Mindfulness may also work by inhibiting intrusive thoughts and allowing for a deeper processing of those stimuli relevant to the task at hand (Brown et al., 2007). Measuring mindfulness has garnered a great deal of interest in the last decade. The principal self-report measures that have been developed to measure mindfulness are listed in chronological order, as follows. 1) Freiburg Mindfulness Inventory (FMI) (Buchheld, Grossman, & Walach, 2001) focusing more on beliefs than on behavioral aspects, as the inventory poses questions about the frequency of feelings or beliefs. Although it is a one-factor measure, it was developed with meditation practitioners and was designed to be used on those individuals who were experienced in meditation, which could make it complex for those subjects who did not practice meditation. 2) Mindful Attention Awareness Scale (MAAS) (Brown & Ryan, 2003), a detailed description of which is included in the instruments section of this article which explains why it was chosen for this research. 3) Kentucky Inventory of Mindfulness Skills (KIMS) (Baer, Smith, & Allen, 2004) consisting of three subscales that measure different mindfulness skills: observe, describe and act with awareness. This structure was not considered to be the best choice for this study, given that a one-factor structure was deemed to be more useful in order to detect more sharply defined relationships with other variables. Baer et al. (2004) suggest a strong relationship between the MAAS and the act with awareness subscale. For their part, the authors proposed the KIMS as a useful measure for those professionals teaching mindfulness skills to their patients. 4) Cognitive and Affective Mindfulness Scale (CAMS) (Hayes & Feldman, 2004), a scale that assesses attention, awareness, acceptance and present-focus, i.e., it is not exactly a mindfulness scale. 5) Toronto Mindfulness Scale (TMS) (Lau et al., 2006), a short one-factor scale, but that was designed to be used in conjunction with meditation. The instructions ask participants to reflect on what they experienced during a preceding meditation session. 6) Five Facets Mindfulness Questionnaire (FFMQ) (Baer et al., 2006), a scale developed by some of the authors who created the KIMS scale, stemming from a factorial analysis of five other scales that measure mindfulness: FMI, MAAS, KIMS, CAMS, and MQ. After conducting the analysis, the authors concluded that five distinct factors exist behind the mindfulness construct. It is thus not a one-factor structure, and in addition includes disparate factors such as "describing/labeling with words." 7) Southampton Mindfulness Questionnaire (SMQ) (Chardwick et al., 2008), a scale that measures mindful awareness of distressing thoughts and images. The authors designed the scale specifically for use with patients with psychosis. 8) Philadelphia Mindfulness Scale (PHMLS) (Cardaciotto et al., 2008), a two-dimensional measure that assesses present-moment awareness and acceptance as components of mindfulness that would not necessarily go together. Although the scale was conceived for both general and clinical populations, the authors used exclusively psychology students as subjects of the general population group when developing and applying the scale. The PHMLS contemplates two constructs, which in the present study are assessed separately with independent measures. For their part, Sauer et al. (2013), upon their review of the state of mindfulness assessment, proposed alternative methods to self-report inventories. These methods consist of: language-based measures, qualitative data gathered from semi-structured interviews, assessment by others and biological and neuropsychological measures. Although it would be more convenient to utilize more objective methods to validate the self-report measurements of mindfulness, unfortunately such methods are still in early stages of development and are not yet standardized. Clinical group: patients with diagnoses characterized by the DSM-IV-TR criteria (APA, 2001). This group was composed of three subgroups: anxiety (N = 50), depression (N = 39), and borderline personality disorder (BPD; N = 11). The first subgroup included panic disorder with agoraphobia, agoraphobia without history of panic disorder, social phobia, obsessive-compulsive disorder, and generalized anxiety disorder. The second group included major depressive disorder, dysthymia, and unspecified mood disorder. The BPD subgroup, although not part of the previous categories, is included because the symptomatology of anxiety and depression is markedly present. All subjects in the clinical group were outpatients at the Clinical Psychology Center at the University Hospital of Guadalajara. Control group: subjects from the general population with no prior history of mental disorders, who were not taking psychoactive drugs and had not seen a psychologist or psychiatrist for any reason in the last two years. These subjects were recruited through advertising and through the "snowball" method by the researchers and other participants. Student group: university students across different academic years and areas of study (Nursing, Speech Therapy, Occupational Therapy) at the University of Castilla-La Mancha. Subjects' age was between 18 and 60. The average age of each group, with its standard deviation, is as follows: control group (M = 36, SD = 12), student group (M = 20, SD = 2), depressed subgroup (M = 36, SD = 9), anxiety subgroup (M = 36, SD = 12), and BPD subgroup (M = 31, SD = 6). Additional sociodemographic characteristics can be found in Table 1. Authorization for the study was requested and subsequently granted by the Clinical Research Ethics Committee of the University Hospital of Guadalajara. All subjects signed an informed consent release before participating in the study. After collecting sociodemographic data, the SCID-I (First, Spitzer, Gibbon, & Williams, 1999) was conducted in order to confirm the appropriate diagnosis for the clinical sample and in order to screen for mental disorders in the control group. Next, the evaluation instruments were applied according to the random order established. Sampling methods precluded counterbalancing, so the order of scales was constant. The MAAS was translated into Spanish using the technique of back translation. One translation team translates the scale into the target language, and then the second team translates it back into the original language. The fidelity of the translation is judged by how closely it matches the original version. As Muñiz and Hambleton (1996) point out, this popular method is not without its flaws. They suggest that the translators not only know both languages, but also be familiar with both cultures. Accordingly, two translators were contracted to help with the study: a North American woman, with experience translating journalism articles, who lived for years in Spain and a Spanish man who also holds a U.S. passport. The translators worked independently of one another, and no relevant differences were found in the way the items were expressed. The authors subsequently reached a consensus on both versions with the translators. Lastly, an English studies professor and other psychologists tweaked several items in order to make them more understandable to the general population. Efforts were made to ensure that the length of the items was equivalent to the original scale. The objective of this semi-structured interview is to establish the most important diagnoses for Axis I disorders of the DSM-IV. The clinician version (SCID-CV), a later adaptation that was fine-tuned for use in clinical settings, was used for this study. The objective of this semi-structured interview is to establish the most important diagnoses for Axis I disorders of the DSM-IV. The Spanish adaptation of the clinician version (SCID-CV) (a later adaptation that was fine-tuned for use in clinical settings) was used for this study (First et al., 1999). The reliability studies of diagnostic instruments are typically based on the consistency between independent assessments made by two or more evaluators. The results are typically expressed as the kappa coefficient. A large number of studies using the SCID to focus on specific diagnostic groups have obtained kappa coefficients ranging from .70 to 1.00 (First et al., 1999). There is no published data for the validity index of the SCID-VC. The decision to use the SCID-CV is based on its widespread use in those publications that seek to add rigor when establishing diagnoses. The MAAS is used to evaluate individual differences in the frequency of mindfulness over a period of time. It consists of 15 items, each of which is an affirmation expressed as a declarative sentence. Subjects gauge how frequently they have experienced a given situation using a 6-point Likert scale. Higher scores indicate greater mindfulness. This scale focusses on the presence or absence of attention and awareness of what is occurring in the present moment, rather than seeking to measure such attributes as acceptance, confidence, empathy, gratitude, or others that have been related to mindfulness. From a scientific perspective, it is interesting to note how this component of the mindfulness construct relates to other psychopathological aspects. The MAAS was chosen because it is brief, can be applied to both clinical and general populations, and does not require subjects who are familiar with meditation, which is a requirement of other instruments. All of the studies that analyze the psychometric properties of the MAAS, including the original, share a single-factor structure. The MAAS is likely the most widely used mindfulness evaluation scale of recent years, due to the fact that in addition to appearing in numerous publications it has been translated to numerous languages: Spanish (Araya-Vargas, Gapper-Morrow, Moncada-Jiménez, & Buckworth, 2009; Cebolla, 2009), Dutch (Schoevers, Nyklicek, & Topman, 2008), German (Michalak, Heidenreich, Strohle, & Nachtigal, 2008), French (Jermann et al. 2009), Swedish (Hansen, Lundh, Homman, & Wangby-Lundh, 2009), Hungarian (Simor, Koteles, Sandor, Petke, & Bodizs, 2011), Turkish (Catak, 2012a) and Chinese (Deng et al. 2012). It should be noted that the aforementioned studies were carried out exclusively with university students, in some cases only psychology students, with the exception of Cebolla's (2009) study, which was conducted using only patients suffering from anxiety or depression. Catak's (2012a) study used elementary school teachers and white collar municipal employees, while Jermann et al. 's (2009) study used a sample of high school students and community participants. Although Araya-Vargas et al. (2009) published a Spanish translation and validation, it was conducted with university students from Costa Rica, resulting in a number of cultural differences. Cebolla's doctoral thesis (2009) also included a Spanish translation of the MAAS, which was quite well-done, although the 9th item was somewhat complicated ("me centro tanto en la meta que quiero conseguir que pierdo contacto con lo que hago en ese momento para estar ahí" versus the item proposed in this study: "me centro tanto en el objetivo que quiero alcanzar que pierdo la noción de lo que estoy haciendo para conseguirlo"). In addition, the 12th item varied from the original meaning in English: ("Voy a sitios con el 'piloto automático' y luego me pregunto por qué fui ahí," vs. "I drive places on 'automatic pilot' and then wonder why I went there"). We consider that the items in this study are easier to understand, particularly for those subjects with fewer years of formal education and mental disorders (see appendix). This was important given that, within the clinical sample of this study, only 28.2% of the subjects in the depression subgroup, 42% in the anxiety subgroup, and 54.5% in the BPD subgroup had completed the equivalent of "compulsory education." For this reason, and because at the outset of this study (2009) no other publications had extended the use of the MAAS in Spanish, an independent translation of the scale was developed. Cognitive Behavioral Avoidance Scale (Ottenbreit & Dobson, 2004) The CBAS is a multidimensional measure of avoidance. It consists of 31 items, which are evaluated using a 5-point Likert scale. The higher the score on the scale, the higher the level of avoidance. The factorial analysis of the CBAS completed by the original authors revealed that four factors account for 44.95% of the variance: Behavioral Social (27.54%), Cognitive Non-Social (7.87%), Cognitive Social (5.30%), and Behavioral Non-Social (4.24%). Ottenbreit and Dobson (2004) conducted their study of the CBAS construction with 391 university students. They found correlations between the four subscales ranging from .39 to .57, suggesting that they were measuring related constructs. They also found elevated correlations between the scores of the subscales and the total score: .78-.80. The Cronbach's alpha for the total scale was .91, indicating a high degree of internal consistency. Between the four subscales, the Cronbach's alpha ranged from .75 to .86. In an adaptation applied to a Spanish population, Barajas and Garra (in press) found a high degree of internal consistency using Cronbach's alpha (.95). This study appears to be the only one to date to have applied the CBAS to a sample consisting of patients with mental disorders, controls, and students. The internal consistency was also high for each of the subscales: CBAS-BS (.93), CBAS-BN (.79), CBAS-CS (.77), CBAS-CN (.88). Barajas and Garra also found significant correlations between the four subscales (from .33 to .67), as well as between these and the total scale (from .62 to .83). The BDI-II is a highly regarded self-report inventory used to detect and measure the severity of depression. It was included in this study because it is the most widely used self-report depression instrument in both clinical practice and research (Sanz, Navarro, & Vázquez, 2003), and also because of its outstanding psychometric properties. Sanz et al. 's (2003) version of the instrument was used in this study. The results of the factorial analysis performed with the Spanish version of the BDI-II suggest that this instrument measures a dimension of general depression consisting of two highly related symptomatic dimensions: cognitive-affective and somatic-motivational. These findings replicate the results obtained by the original authors, who found a high degree of internal consistency (α = .89). In our study, the mean score of the clinical group was 21.37 and the mean score of the control group was 4.50. The BAI is one of the most widely used self-report inventories for evaluating anxiety symptomatology in both patients with mental disorders and the general population. It is widely used in both clinical settings and in research. This study used the BAI version developed by Sanz and Navarro (2003). Over the last two decades, various Spanish translations of the BAI have been published, but the first to analyze the psychometric properties in a Spanish general population were Magán, Sanz, and García-Vera (2008). That study found a high degree of internal consistency of the BAI (α = .93), as well as a correlation with the BDI-II of .63. The mean score and the range of scores recorded were similar to those found in populations in other countries. In the present study, the mean score for the clinical group was 21.41, while the mean score for the control group was 4.19. The Acceptance and Action Questionnaire-II evaluates the constructs of acceptance, experiential avoidance, and psychological inflexibility. A 7-point Likert scale is used to measure responses. Higher scores indicate greater psychological inflexibility, and lower scores indicate psychological acceptance. Bond et al. (2011) found that high scores on the AAQ-II reflect greater emotional dysfunction, such as poor general mental health, higher levels of anxiety, depression and stress, as well as less overall ability to cope with life. The authors contended that high levels of psychological inflexibility could even be a risk factor for mental illness. Bond et al. (2011) published results obtained from 2816 subjects divided into six samples and three studies on two versions of the AAQ-II, one consisting of 7 items and the other consisting of 10. We used the 10-item version for our study. For that version, Bond et al. (2011) reported a bifactorial structure, where one factor accounted for 41.47% of the variance, and the other accounted for 4.94%. The average score of the 206 university students of the sample was 30.69 (SD = 9.91). The Cronbach's alpha was .87. With respect to convergent validity, there was a correlation of .91 with the AAQ-I, between .69 and .71 with the BDI-II, and .58 with the BAI, all of them significant. Bond et al. (2011) affirm that the translations and empirical studies conducted using the 10-item version are not invalid, given that they found a correlation of .96 between the versions of 7 and 10 items. The 7-item version was found to be slightly psychometrically superior, and is thus considered to be the final version of the AAQ-II. Ruiz, Langer, Luciano, Cangas, and Beltrán (2013) have recently published the Spanish version of the 7-item AAQ-II. These authors have also underscored the fact that the 10-item version, of which 3 items are scored inversely, has been widely used in previous studies, although the 3 items in question were eventually eliminated from the scale. The authors concurred with Bond et al. (2011) that the 10-item version is not significantly weaker than the 7-item version, and thus it should not be assumed that studies carried out with the 10-item version are invalid. Ruiz et al. (2013) found that the data that they gathered are similar to that of Bond et al. (2011). In our study, the mean score was 44.65 for the clinical group and 24.08 for the control group. As seen in Table 1, the sociodemographic characteristics of the groups differed significantly, which could have resulted in potential confounding factors. It was necessary to assess the potential confounding factors using the following analyses: Spearman´s rho for age, the Mann-Whitney U and Wilcoxon W tests for gender, and the chi-squared and Kruskal-Wallis tests for marital status, education, socioeconomic status, and occupation. We determined that, for all groups, education, socioeconomic status, and occupation are potential confounding factors. We thus provided the raw p-values (without adjustment) as well as the adjusted p-values for the potential confounding factors where necessary. 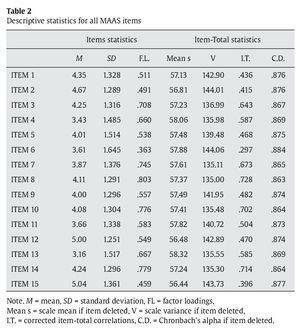 Bivariate analysis confirmed the normality and symmetry of the MAAS scores, which allowed for the use of ANOVA tests to examine the associations and differences among the groups. SPSS version 17 was used to do the statistical analyses. Cronbach's alpha was used to evaluate the internal consistency of the MAAS for the total sample (N = 254) composed of patients, controls, and students. A high degree of internal consistency was found (α = .88). These reliability results closely match those found in previous studies conducted in different countries using different adaptations of the scale: .89, Mackillop and Anderson (2007); .88, Araya-Vargas et al. (2009); .86, Baer et al. (2006); .85, Deng et al. (2012); .83, Michalak et al. (2008); .82, Brown and Ryan (2003); and .78, Simor et al (2011). All were carried out using student samples. Carlson and Brown (2005) found an alpha of .87 in both a student sample and a sample of cancer patients. The confirmatory factor analysis (CFA) results for a single-factor structure, such as the one reported by the authors cited above, can be found in Table 2. These results are quite satisfactory, given that the factor loadings for all items are above .36; in fact, with the exception of items 2, 6 and 15, the factor loadings exceed .5. For the corrected item-total correlations, only one item was below .4 (item 6). All alpha values remained above .86 if any one item was deleted. To assess the goodness of fit of the analyzed data to the proposed one-factor model, the Kaiser-Meyer-Olkin measure of sampling adequacy was used (KMO = .899) as well as Bartlett´s test of sphericity, χ2(105) = 1374.17, p < .001. The KMO coefficient ranges between 0 and 1, and indicates that the factorial analysis is more adequate as the value increases. With regard to Bartlett's test, the significance level is perfect. Both results indicate that the goodness of fit is satisfactory, and that the performance of the factorial analysis is adequate. The mean MAAS score for the control group (M = 4.64) was higher than that of the clinical group (M = 3.57), resulting in a significant difference (p < .001). The difference between the clinical group and the student group (M = 4.08) was also statistically significant (p < .001 raw p-value and p = .004 adjusted p-value), as was the difference in the mean MAAS score between the control group and the student group (p < .001 with and without adjustment). These results can be compared to those obtained by other researchers using samples in other countries (see Table 4), though most of those studies were conducted on university students. Those scores range from 3.72 to 4.45. In addition, Kirk Warren Brown (n.d.), the first author of the original scale, provides on the resources page of his website at Virginia Commonwealth University the following results obtained by applying the English version of the scale to four independent samples of community adults: N = 436, MAAS M = 4.20, SD = 0.69. For 14 independent samples of college students, he provides the following results: N = 2,277, MAAS M = 3.83, SD = 0.70. Researchers who have conducted studies on clinical samples have limited themselves to studying cancer patients or pain clinic patients, not patients with mental disorders. 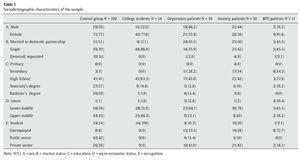 No significant gender differences were found in the clinical, control, or student groups. These results are consistent with those reported by Catak (2012a), Deng et al. (2012), and Mackillop and Anderson (2007), who found that MAAS is not gender-related. No significant correlation was observed between the MAAS score and age, which is consistent with Catak (2012a). 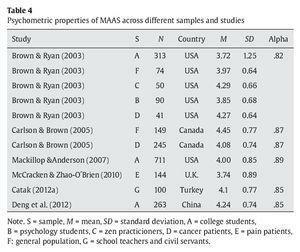 The MAAS was inversely related to the remainder of the measures (CBAS, BDI-II, BAI, AAQ-II), and the correlations were significant (p < .05) in both the clinical and the control group, with the exception of the correlation between MAAS and BDI-II for the control group (see Table 5). This would suggest that greater mindfulness is related to less cognitive-behavioral avoidance, less anxiety symptoms, and greater psychological acceptance. Also, at least among those clinical subjects with anxious-depressive symptomatology, it would appear that greater mindfulness corresponds to lowered levels of depressive symptoms. In the student group, only the MAAS and CBAS scales were applied and no significant correlation was observed, with the exception of the correlation between MAAS and the CBAS-BS subscale (r = -.382, p = .04). Although Jermann et al. (2009) observed a significant correlation between MAAS and BDI-II (r = -.52) in a sample composed primarily of high school students (58%), we did not observe this result in our control sample. This last result once again raises questions about studies carried out exclusively with student samples. A number of studies have reported a correlation between MAAS scores and a variety of psychopathological indicators, although most of them did not examine that correlation with the assessment instruments used in our study. For example, the original authors of the scale (Brown & Ryan, 2003) observed significant inverse correlations with the BDI (-.41 and -.42) and with other measures of depression and anxiety. Catak (2012b) also observed significant inverse correlations with the BDI and the BAI (-.42 and -.34 respectively) in a student sample. The recent Spanish study conducted by Ruiz et al. (2013) found a link between psychological inflexibility and mindfulness in a sample of 122 university students, as shown by a significant inverse correlation (r = -.31) between the AAQ-II and the KIMS "act with awareness" subscale. For their part, Baer et al. (2004) suggest a strong link between this subscale and the MAAS, given that their study with 115 students revealed a correlation of .57. Subsequently, Baer et al. (2006) found a significant correlation between MAAS and AAQ-I (r = -.36). Those results align with the results from our study, which found a statistically significant inverse correlation between MAAS and AAQ-II (-.354 for the clinical sample and -.395 for the control sample). The MAAS, as translated and adapted to Spanish for the present study, demonstrates good psychometric properties. The MAAS shows a high degree of internal consistency with little difference in the alpha value throughout multiple studies conducted with different samples, although it must be noted that these studies were done using only student samples (Araya-Vargas et al., 2009; Baer et al., 2006; Brown & Ryan, 2003; Deng et al., 2012; Mckillop & Anderson, 2007; Michalak et al., 2008; Simor et al., 2011), or using samples that were too homogeneous or not representative of the general population (Carlson & Brown, 2005; Catak, 2012a; Jermann et al., 2009). In contrast, the study presented here is unique in that it was conducted on a sample that included patients with psychological disorders, the general population, and students. Moreover, the results of the confirmatory factorial analysis demonstrate goodness of fit, supporting the one-factor structure of the scale found by the aforementioned authors. Items factor loadings range between .36 and .80, and are above .5 in 12 of the items on the scale. The corrected item-total correlations fall between .30 and .73. These results are similar or slightly superior to those found by Catak (2012a) (factor loadings: .21-.73, with six items > .5; corrected item-total correlations: .17-.64) and Jermann et al. (2009) (factor loadings: .20-.79, with six items > .5; Corrected item-total correlations: not reported). Normal subjects exhibit greater mindfulness, at least as measured by the MAAS (attention to the present moment), than patients with clinical symptoms of anxiety and/or depression. Scoring differences also exist between students and patients, with students demonstrating greater mindfulness. Likewise, a general population sample demonstrates greater mindfulness than a student sample. These differences are statistically significant. These findings raise questions about mindfulness studies that use only students, or use only students as a control group, because the results cannot be generalized to the general population or to a clinical group. With this in mind, we suggest that MAAS can be used to differentiate not only between a sample from the general population and a clinical sample, but also between a general population sample and a student sample. Nevertheless, the same cannot be said for the degree of differentiation between clinical groups suffering anxiety and depression. Generally speaking, the MAAS scores recorded in this study closely match those from other studies (Brown & Ryan, 2003; Carlson & Brown, 2005; Mackillop & Anderson, 2007), although they are slightly higher. The only exception is the score of the sample of Spanish students (M = 4.08) compared to the Chinese students' score, reported in the study done by Deng et al. (2012) (M = 4.24). Nevertheless, it is not possible to know whether this difference is significant. It would be useful to be able to analyze possible culture differences in mindfulness in future studies. With respect to those studies reporting the average score and having a clinical sample, these were conducted using cancer patients (Brown & Ryan, 2003; Carlson & Brown, 2005) or patients with pain disorders (McCracken & Zhao-O´Brien, 2010), but not with patients suffering psychological disorders. In this sense, the data reported here on a sample with anxiety and depressive disorders constitutes an advance in the research. Nevertheless, the results must be replicated in subsequent studies, and the differences in mindfulness between different diagnostic categories also require further study. As with previous studies published that have proposed a relationship between mindfulness and different indicators of health or psychopathology (Baer et al., 2006; Brown et al., 2007; Hayes & Feldman, 2004; Roemer et al., 2009), this study found an inverse relationship between mindfulness and: cognitive-behavioral avoidance, experiential avoidance, anxiety and depression. Nevertheless, because the relationship between mindfulness and depression was not found to be significant in the control group, more research is needed to analyze that relationship using clinical samples and samples of the general population. Finally, we should note that the student sample used in this study is small, and thus the comparison of results to the sample should be interpreted with caution. The authors of this article declare no conflicts of interest. The authors would like to thank Antonio Segura, Director of Research Services at the Institute of Health Sciences, Castilla-La Mancha, for his contributions during the statistical analyses of the data. Santiago Barajas. Hospital Universitario de Guadalajara. C/ Donante de Sangre s/n. 19002 Guadalajara. Spain. American Psychiatric Association. (2001). Manual diagnóstico y estadístico de los trastornos mentales. DSM-IV-TR. Barcelona: Masson. Araya-Vargas, G. A, Gapper-Morrow, S., Moncada-Jiménez, J., & Buckworth, J. (2009). 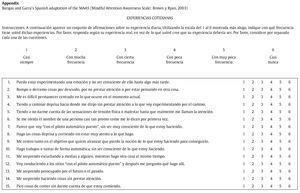 Translation and Cross-Cultural Validation of the Spanish Version of the Mindful Awareness Attention Scale (MAAS): An Exploratory Analysis and Potential Applications to Exercise Psychology, Sport and Health. International Journal of Applied Sports Sciences, 21(1), 94-114. Arch, J. J., & Craske, M. G. (2006). Mechanisms of mindfulness: Emotion regulation following a focused breathing induction. Behaviour, Research and Therapy, 44, 1849-1858. Baer, R. A., Smith, G. T., Hopkins, J., Krietemeyer, J. & Toney, L. (2006). Using self-report assessment methods to explore facets of mindfulness. Assessment, 13 (1), 27-45. Barajas, S., & Garra, L. (in press). Avoidance in anxiety and depression: Adaptation of the Cognitive-Behavioral Avoidance Scale (CBAS) in a Spanish sample. (Manuscript submitted for publication). Beck, A. T., & Steer, R. A. (1993). Beck Anxiety Inventory. Manual. San Antonio, TX: The Psychological Corporation. Beck, A. T., Steer, R. A., & Brown, G. K. (1996). BDI-II. Beck Depression Inventory-Second Edition. Manual. San Antonio, TX: The Psychological Corporation. Bishop, S. R., Lau, M., Shapiro, S. L., Carlson, L., Anderson, N. D., Carmody, J., ... Devins, G. (2004). Mindfulness: a proposed operational definition. Clinical Psychology: Science and Practice, 11, 230-241. Bond, F. W., Hayes, S. C., Baer, R. A., Carpenter, K., Guenole, N., Orcutt, H. K., ... Zettle, R. D. (2011). Preliminary psychometric properties of Acceptance and Action Questionnaire-II. A revised measure of psychological inflexibility and experiential avoidance. Behavior Therapy, 42, 676-688. Borkovec, T. D. (2002). Life in the future versus life in the present. Clinical Psychology: Science and Practice, 9, 76-80. Brown, K. W., & Ryan, R. M. (2004). Perils and promise in defining and measuring mindfulness: observations from experience. Clinical Psychology: Science and Practice, 11, 242-248. Buchheld, N., Grossman, P., & Walach, H. (2001). Measuring mindfulness in insight meditation and meditation-based psychotherapy: The development of the Freiburg Mindfulness Inventory (FMI). Journal for Meditation and Meditation Research, 1, 11-34. Cardaciotto, L., Herbert, J. D., Forman, E. M., Moitra, E., & Farrow, V. (2008). The assessment of present-moment awareness and acceptance: The Philadelphia mindfulness scale. Assessment, 15, 204-223. Carlson, L. E., & Brown, K. W. (2005). Validation of the Mindful Attention Awareness Scale in a cancer population. Journal of Psychosomatic Research, 58, 29-33. Catak, P. D. (2012a). The Turkish version of Mindful Attention Awareness Scale: Preliminary findings. Mindfulness, 3, 1-9. Catak, P. D. (2012b). The Turkish version of the Cognitive and Affective Mindfulness Scale-Revised. Europe´s Journal of Psychology, 8, 603-619. Chadwick, P. Hember, M., Symes, J., Peters, E., Kuipers, E., & Dagnan, D. (2008). Responding mindfully to unpleasant thoughts and images: reliability and validity of the Southampton Mindfulness Questionnaire (SMQ). British Journal of Clinical Psychology, 47, 451-455. Deng, Y., Li, S., Tang, Y., Zhu, L., Ryan, R., & Brown, K. (2012). Psychometric properties of the Chinese translation of the Mindful Attention Awareness Scale. Mindfulness, 3(1), 10-14. First, M. B., Spitzer, R. L., Gibbon, M., & Williams, J. B. (1999). Entrevista clínica estructurada para los trastornos del eje I del DSM-IV. Versión clínica. Guía del Usuario. Barcelona: Masson. Hansen, E., Lundh, L., Homman, A., & Wangby-Lundh, M. (2009). Measuring mindfulness: pilot studies with the Swedish versions of the Mindful Attention Awareness Scale and the Kentucky Inventory of Mindfulness Skills. Cognitive Behavior Therapy, 38 (1), 2-15. Hayes, A. M., & Feldman, G. (2004). Clarifying the construct of mindfulness in the context of emotion regulation and the process of change in therapy. Clinical Psychology: science and practice, 11, 255-262. Jermann, F., Billieux, J., Laroi, F., D'Argembeau, A., Bondolfi, G., & Zermatten, A. (2009). Mindful Attention Awareness Scale: Psychometric properties of the French translation and exploration of its relations with emotion regulation strategies. Psychological Assessment, 21, 506-514. Kabat-Zinn, J. (1990). Full catastrophe living: using the wisdom of your mind and body to face stress, pain and illness. New York: Delacorte (Edición en castellano: Vivir con plenitud las crisis. 2003. Ed. Kairós). Lau, M. A, Bishop, S. R., Segal Z. V., Buis, T., Anderson N. D., Carlson, L., ... Gerald, D. (2006). The Toronto Mindfulness Scale: development and validation. Journal of Clinical Psychology, 62, 1445-1467. Mackillop, J., & Anderson, E. J. (2007). Further psychometric validation of the Mindful Attention Awareness Scale (MAAS). Journal of Psychopathology and Behavioral Assessment, 29, 289-293. Magán, I., Sanz, J., & García-Vera, M. P. (2008). Psychometric properties of a Spanish version of the Beck Anxiety Inventory (BAI) in general population. Spanish Journal of Psychology, 11, 626-640. McCracken, L. M., & Zhao-O´Brien, J. (2010). General psychological acceptance and chronic pain: there is more to accept than the pain itself. European Journal of Pain, 14 (2), 170-175. Michalak, J., Heidenreich, T., Strohle, G., & Nachtigal, C. (2008). Die deutsche version der Mindful Attention Awareness Scale (MAAS). Zeitschrift für Klinische Psychologie Und Psychotherapie, 37, 200-208. Muñiz, J., & Hambleton, R. K. (1996). Directrices para la traducción y adaptación de los tests. Papeles del Psicólogo, 66, 63-70. Ottenbreit, N. D., & Dobson, K. S. (2004). Avoidance and depression: the construction of the Cognitive-Behavioral Avoidance Scale. Behaviour Research and Therapy, 42, 292-313. Roemer, L., Lee, J. K., Salters-Pedneault, K., Erisman, S. M., Orsillo, S. M., & Mennin, D. S. (2009). Mindfulness and emotion regulation difficulties in Generalized Anxiety Disorder: preliminary evidence for independent an overlapping contributions. Behavior Therapy, 40, 142-154. Ruiz, F. J., Langer, A. I., Luciano, C., Cangas, A. J., & Beltrán, I. (2013). Measuring experiential avoidance and psychological inflexibility: the Spanish version of the Acceptance and Action Questionnaire-II. Psicothema, 25(1), 123-129. Sanz, J., & Navarro, M. E. (2003). Propiedades psicométricas de una versión española del Inventario de Ansiedad de Beck (BAI) en estudiantes universitarios. Ansiedad y Estrés, 9, 59-84. Sanz, J., Navarro, M. E., & Vázquez, C. (2003). Adaptación española del Inventario para la Depresión de Beck-II (BDI-II). Propiedades psicométricas en estudiantes universitarios. Análisis y Modificación de Conducta, 29, 239-288. Sauer, S., Walach, H., Schmidt, S., Hinterberger, T., Lynch, S, Büssing, A., & Kohls, N. (2013). Assessment of mindfulness: Review on state of the art. Mindfulness,4(1), 3-17. Schoevers, M., Nyklicek, I, & Topman, R. (2008). Validatie van de nederlandstalige versie van de Mindful Attention Awareness Scale. Gedragstherapie, 41, 225-240. Simor, P., Koteles, F., Sandor, P., Petke, Z., & Bodizs, R. (2011). Mindfulness and dream quality: the inverse relationship between mindfulness and negative dream affect. Scandinavian Journal of Psychology, 52, 369-375. Sloan, D. M. (2004). Emotion regulation in action: Emotional reactivity in experiencial avoidance. Behaviour Research and Therapy, 42, 1257-1270.